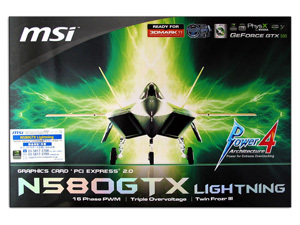 Today we bring you the latest and fastest GeForce GTX 580 that MSI has to offer. 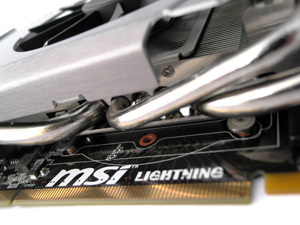 Labelled the "Lightning," it brings a completely custom PCB design and features MSI's Power4 architecture, including a 16 power phase design, independent memory power, CopperMOS mosfets for higher current capacity and quality Proadlizers to optimise power supply and increase overclocking capabilities. All this is topped off by their latest Twin Frozer III cooling solution and full-featured Afterburner overclocking software. So let's get into it! 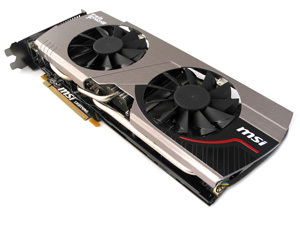 The MSI GTX 580 Lightning measures in at approximately 305 millimetres in length (12 inches) including the cooler shroud, and a minimum of 700W or greater system power supply is recommended. 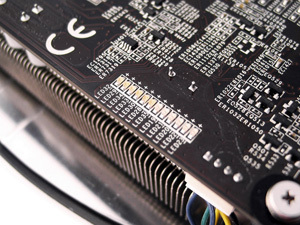 Cooling is provided by a custom Twin Frozer III solution that combines multiple heatpipes, two large 9cm fans and a large aluminium fin array allowing for efficient heat transfer from the power hungry GF110 graphics processor core. 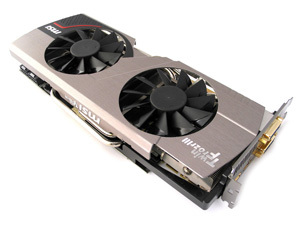 As with the majority of mainstream NVIDIA graphics cards it features support for NVIDIA's SLI multi-GPU technology, 3D Vision, 3D Vision Surround (two cards required), CUDA technology, PhysX acceleration and Microsoft DirectX 11 game support, as well as a variety of video enhancement technologies under the NVIDIA PureVideo HD umbrella to assist in media playback. More information about these technologies can be found here. 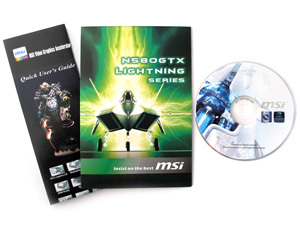 Inside the box we find a quick user's guide and a more detailed manual for the features and general requirements of the video card. A software and driver disc for installation is also included. 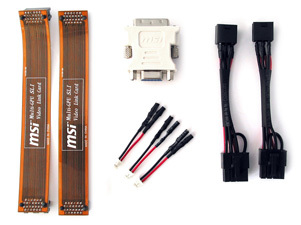 Two PCI-Express 6-pin to 8-pin power connectors are present, as well as a DVI to VGA converter and two lengthy SLI cables. 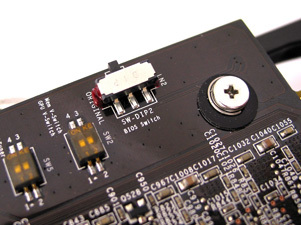 One neat and unique feature is the three short black and red cables that connect to the three voltage monitoring plugs at the edge of the card, allowing you to use a multimeter or similar device to keep an eye on the voltages directly. 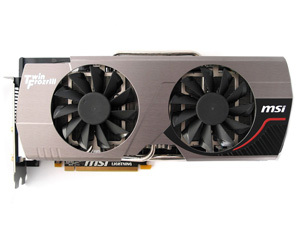 MSI's GTX 580 Lightning has moved away from the NVIDIA reference design found in the majority of GTX 580s. The first change was the mini-HDMI connector, replaced by a full-sized HDMI, plus the addition of a DisplayPort connection. 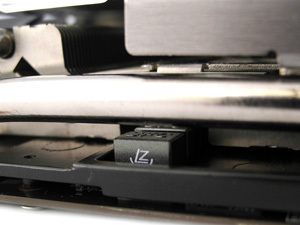 Two DVI connectors are present as per the reference design. 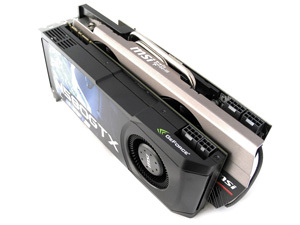 Bitstreaming support for both Dolby True HD and DTS-HD Master Audio are not present like in the GTX 560 Ti and lower models. 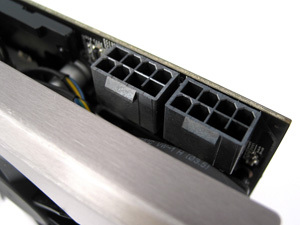 On the top of the card we find a pair of SLI connectors. 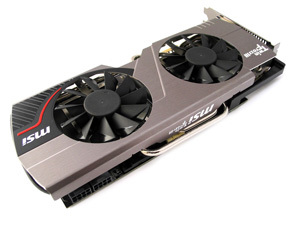 Unlike mainstream video cards like the GTX 560, the GTX 580 allows 3-way SLI and up to 4-way SLI with supporting motherboards, just like we find on NVIDIA's reference design. 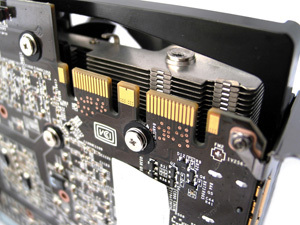 At the far end of the card there are a pair of 8-pin PCI-Express power connectors to make sure the card is adequately fed when overclocking. 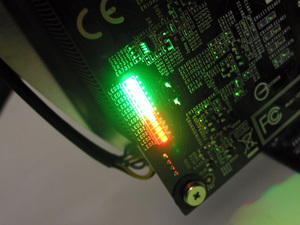 Three voltage check points for the GPU, Memory and PLL (PCI-Express interface) are present on the edge of the card, and as mentioned earlier, MSI include a set of cables that you can attach easily to your multimeter (not provided) for accurate voltage monitoring while benchmarking or volt-modding. 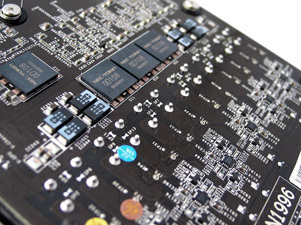 In addition to those voltage check points, MSI include their own dual-BIOS switch catering to extreme overclockers looking to resolve cold bug issues when playing with sub-zero temperatures. 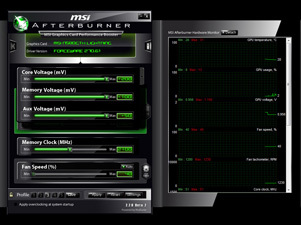 To complement the voltage adjustment available in software, MSI include Mem Voltage, GPU Voltage, PWM Clock Tuner and OCP Unlocker switches near the end of the card to help tune PWM clock ripple elimination, instantly unlocking voltages without delay, and removing overclock protection for a variety of extreme overclocking scenarios. 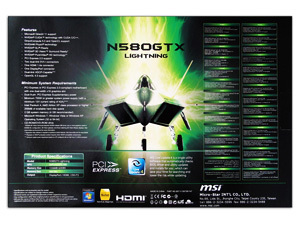 On the power delivery front, the MSI GTX 580 Lightning includes a total 16 power phases, with a row of 12 red and green bright LEDs, each representing one of the 12 GPU PWM phases; double the amount of phases a standard reference design GTX 580 includes (6 phases). 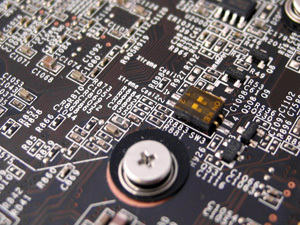 The remaining phases take care of the memory (3 phases) and PCI Express bus power (1 phase), and due to the significant increase in power delivery MSI's engineers needed to increase the PCB size as pictured at the start of this review. 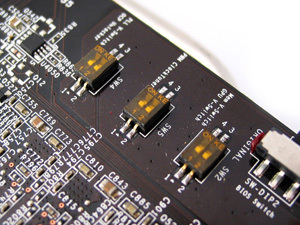 In addition, multiple NEC-Tokin 0D108 Proadilizer chips have been added to handle decoupling at higher frequencies, while also reducing electrical impedance and reducing space taken by the usual bank of capacitors that are required for decoupling. 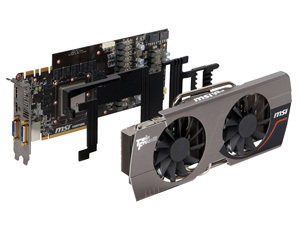 One of the most obvious ways that MSI's card differs from the reference cards, apart from the PCB, is the cooling system. 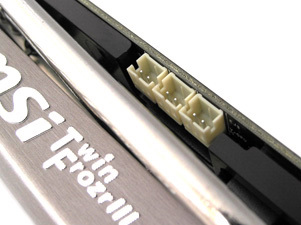 The card sports MSI's own next-generation TwinFrozr III thermal cooling solution with five heatpipes to transfer the heat load, via a nickel-plater copper base, to a high-density aluminium heatsink which is cooled by two 9cm PWM controlled fans. 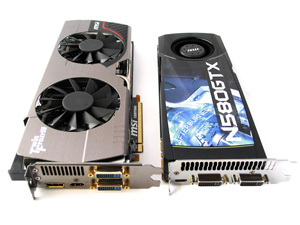 Below we have a simple visual comparison between a reference GTX 580 and the GTX 580 Lightning. 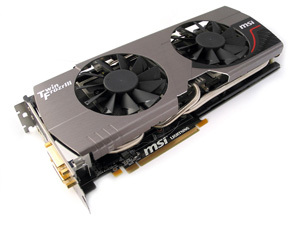 As you can clearly see MSI's version of the GTX 580 is almost unrecognisable to its original form factor; MSI have left nothing unchanged. Many users are now familiar with MSI's Afterburner software that is developed in partnership with the people that created RivaTuner. 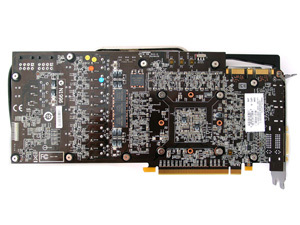 This software works with the video card to allow for the adjustment of the core (GPU), memory and PCI-Express (PLL) voltages as well as the usual core and memory frequencies and monitoring capabilities in a single software package. All original content copyright James Rolfe. All rights reserved. No reproduction allowed without written permission. Interested in advertising on OCAU? Contact us for info.